We enjoyed this lovely Chicken and Vegetable Pie during the week on one of the wet and cold nights that are starting to become all too regular around these parts. The photos are very average as the pies in these shots are actually the leftovers reheated in the oven the next day for lunch. I promise they were puffier and prettier when we ate them straight from the oven. But the quickly diminishing evening light makes it impossible to take any decent photos of our dinners. But the pie was so good I didn't want to wait until the next time I made it to share with you. I'll endeavour to take better photos the next time I make it! 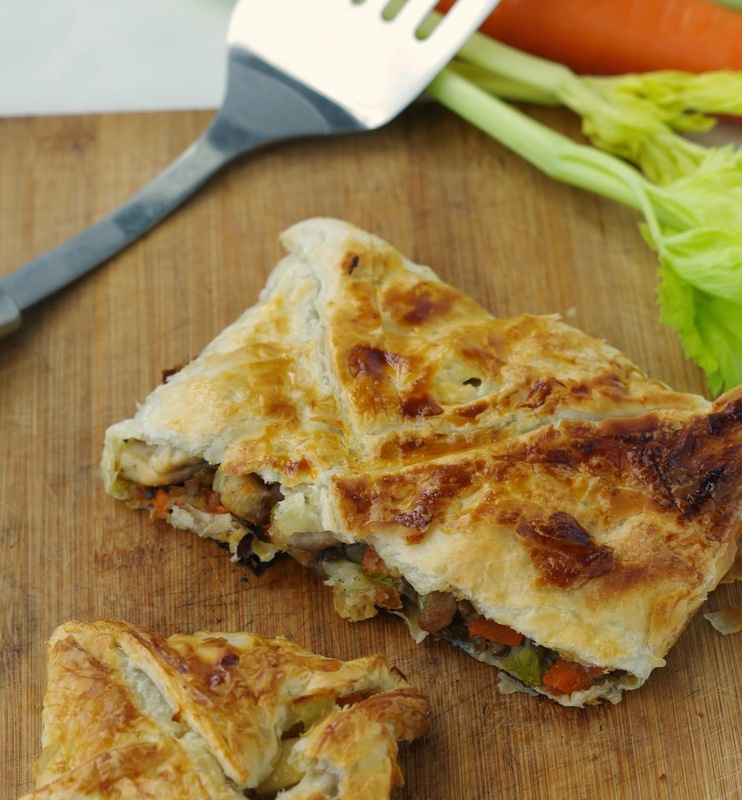 Compared to other chicken pies I've made in the past, this one is loaded with veggies and yet it still has enough flavour to ensure it tastes and feels like warm comfort food. Next time I might try cooking it in a pie dish so I don't need to use as much puff pastry. You could also try substituting evaporated milk for the cream, but really, it's only 1/2 cup. I made two different portion sizes. For the boys I cut one sheet of puff pastry into quarters to make four pies from one sheet. I used one sheet of pastry for each of the adult size pies. Half a sheet would probably be ideal but then you'd have a rectangle instead of a square which doesn't make for pretty parcels. Less voracious eaters than ourselves would be satisfied with sharing one pie with a side of home-made wedges. JJ couldn't get enough of the pie, he devoured two small ones and was still demanding more. I love it when that happens! Remove puff pastry sheets from freezer to thaw. Dice carrot and parsnip and place in microwave safe dish. Cover with cling wrap and cook in microwave for 8-10 minutes or until just tender. Add oil and butter to fry pan and cook chicken until it starts to brown and is almost cooked through. Remove chicken from pan and set aside. Add garlic, leek and celery to pan and saute until is has softened. Stir though flour and cook for 1 minute. Add water to de-glaze pan and then bring to the boil for 1 minute. Add stock and cream and cook stirring for 2-3 minutes over medium to low heat until it starts to thicken. Add chicken, carrots, parsnip, peas, lentils and sage to the pan. Set aside to cool. Divide the mixture evenly, placing it in the middle of each of the four sheets of pastry. Pull the sides up to form a parcel, pinching the sides together. Place parcels on baking tray lined with baking paper, brush with beaten egg and cook for 25 minutes or until golden brown. Do you prefer chicken or beef pies? I much prefer chicken pies, I blame it on working in a pie shop for most of my teenage years! These look delicious, our boys would love them too. As the weather cools down my craving for pie increases and I love nothing more than a simple chicken and vegetable pie. Yours looks delicious and I'll have to give it a go! ha ha - I do that too. I forget to take photos and then think, oh that was really yummy I should share that, then have to try and snap some photos. Thanks for sharing, sound yummy! Reference - Paul, B., n.d. RoidX Juice Dr. Recommended Formula. [WWW Document]. HGHOfficial.com, i.e. HGH Official. URL, https://hghofficial.com/roidx-juice/ (accessed 02.15.19).